That schedule has the Slugs on the road beginning in late January and lasting through March, though the team will have an alumni exhibition on Feb. 24 at home. 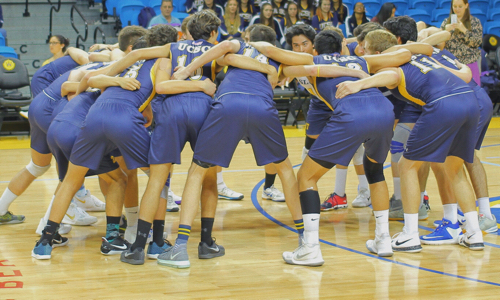 Last season’s performance by the UC Santa Cruz men’s volleyball team would be considered a success by most metrics. The Banana Slugs compiled a 14–5 overall record (including an undefeated mark through the month of February), ending their campaign with three straight victories. They finished with the No. 9 ranking in the NCAA Division III AVCA Coaches Poll. But, despite their accomplishments and top–10 ranking, the Slugs fell short of qualifying for the NCAA tournament. No need, of course, to explicitly state the team’s remaining objective. “That’s definitely the goal,” said senior outside hitter Ryan Manley (Monte Vista High/Cupertino), who was a freshman when the Slugs last reached the postseason tournament in 2015. That year, UC Santa Cruz went 23–5. 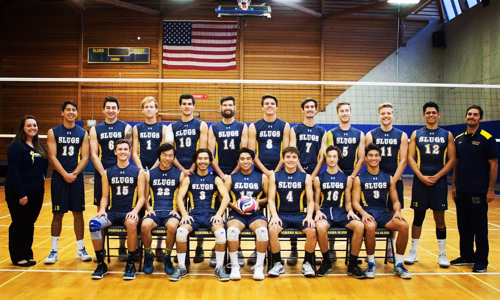 Aided in May by the passage of Measure 68, the referendum that will go to support athletics, the Slugs this season are scheduled to play more than 30 matches—a noticeable uptick from the 19 last season. Among the challengers will be 23 D-III opponents (also an increase, from just 14 last year)—matches that will go a long way determining if the Slugs’ name will be called by the NCAA in April. The Slugs (6–0) take to the road this week to face UC San Diego in La Jolla on Friday and UC Merced Sunday. “It’s going to be a push and we’re going to have to perform in some high-pressure matches,” Manley said. “But I think this group is able to do it, especially with the guys coming in. That schedule has the Slugs on the road beginning in late January and lasting through March, with only the team’s alumni exhibition on Feb. 24 slated at home. The Slugs will play as far north as Milwaukee and as far east as Poughkeepsie, N.Y.
Third-year head coach Paul Leon, who has been involved with the UC Santa Cruz program for the last eight years, said the heavy road slate is standard practice as a D-III team on the West Coast. If the Slugs are able to extend their season to the NCAA tournament, becoming road warriors will need to be part of the team’s mentality. “We’re geared up and ready to go,” said Leon, who feels the depth among his 17-player roster, which includes 10 who returned, will help the Slugs push deep into the season. Leon lost three players last season to graduation, including kills leader and second team All-American Jake Howard. But outside hitter Lake Merchen (Buchanan High/Clovis) returns to the roster and will once again guide the Slugs. The 6-foot–3 senior last season was named All-American first team by the AVCA for a second time, becoming the fourth Slug to do so and the first since Salvatore La Cavera in 2013. Manley said his standout teammate is special, exhibiting a great mindset and a high volleyball IQ. It’s like having another coach on the floor; Merchen does as much with the Mountain View Volleyball Club. “He’s been amazing since freshman year,” Manley said of Merchen, who is closing in on career records for kills, digs, and aces. Merchen will, no doubt, garner much of the spotlight from the opposition. But the Slugs are hoping not to rely solely on their All-American. Along with the 6–5 Manley, senior outside hitter Gino Gamboa (Bishop Alemany High/Van Nuys) will help UCSC on the attack. Gamboa returns from medical leave last season, after registering 1.82 kills per set as a junior, while outside hitter Chris Salas (Camarillo High/Camarillo) joins the roster as a junior transfer from Moorpark College. “He’s been a really good addition,” Manley said of Salas, noting the transfer player’s passing. Junior Kyle Donohoe (Victor High/Victor N.Y.), who last season was third in kills, could provide a midseason boost on the attack. The 6–3 opposite underwent shoulder surgery in the offseason and is expected to return to the lineup in late January/early February. Senior setter Evan Kittle (Nevada Union High/Nevada City) returns after playing as a sophomore, when he recorded a team-best 592 assists. Also returning are juniors Raymond Cascio (Obama Academy/Pittsburgh, Pa.) and Justin Fortner (Hart High/Santa Clarita), who at 6–7 and 6–6, respectively, provide plenty of size from the middle blocker position. Like Salas, libero Max Garris (St. Monica High/Santa Monica) is also a junior transfer, from Santa Monica College, and will offer a different look alongside returning junior libero Jonathan Santos (St. Ignatius College Prep/Daly City). UC Santa Cruz added four first-year students to the roster, with setter Sam Wittert (Santa Monica High/Santa Monica), and outside hitters Ian Pizzuti (Redondo Union High/Redondo Beach), Quinn Barrett (Leigh High/San Jose) and Anthony Sagely (Thousand Oaks High/Camariilo) looking to make an impact. Manley was a freshman in 2015—the last time the Slugs qualified for the NCAA tournament. He is one of six current players who competed that season, along with Merchen, Kittle, Gamboa, setter Shad Harris (Edison High/Huntington Beach) and defensive specialist Cody Hiroto (Rio Hondo Prep/Temple City). Qualifying again for the NCAA tournament would validate the Slugs’ growth in recent years, Manley said. “I think the cohesion as a whole unit,” Manley said, “there’s no one who feels their voice can’t be heard.